About 3 years ago, I was invited to a wedding at a local hotel. Found an outfit to wear and kept it moving. Well, the morning of the wedding, we found out that it was OUTDOORS poolside at a hotel. At 1pm in the muggy, summer Tampa Heat? Oh heck naw. After having a moment of empathy for hubby (he was IN the wedding, and wearing a tux. 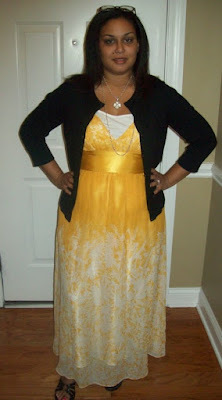 ), I decided that the dress I originally picked was not going to cut it. I ran over to the Macy's around the corner from the hotel. Their dress clearance was marked an additional 70% off the lowest marked price. It was chaos on the sales floor and in the fitting rooms. I bought four options for $39.00 without trying them on - I was in a hurry, and figured one of them should fit me. The one I am wearing above is 100% silk, and tag says Donna Ricco. It was $6.00 after all the markdowns. (Original price $168) I did not wear it the wedding that day, and had not worn it before today. Well, Michelle's blog reminded my of the dress...and, thanks to some inspiration from 'Patina', Kyla and some other bloggers who wear maxi dresses, I finally pulled it out of my closet. So, while this was not my best deal ever - I do believe that with today's wearing, I got my $6.00 out of it - hehe. On another note, I don't have a Macy's within 85 miles of my house now. The inhumanity of it all!! I think the dress looks beautiful on you. Scouts Honor!!!!!! You practically got it for free. Please wear it again. I love it on you. Thanks for the shout out! This is a gorgeous dress and I think it looks rather amazing on you! I would love to see it without the cardigan. Sometimes, it is something that is out of our comfort zones and it's hard to get used to, but it really does look great on you! Stinks you don't feel your best in it, because it is a pretty dress! I like your yellow dress by Macys... You're looking great in this one! !